The fast or quick hydrating guar gum powder (FHG) is a derived from the guar plant, but unlike the ordinary guar gum powder which causes viscosity in a period of two hours; this achieves almost complete viscosity in just a few minutes. The powder belongs to the category of industrial grade guar gum powder. The FANN viscosity reading is the widely regarded as the standard for measurement of viscosity for the drilling fluids. They are also used in measuring the gel strength of the drilling mud. The viscometer is a rotational cylinder and bob instrument. It has got two operational speeds of 300 and 600 rpm. It is referred to as the direct reading or direct indicating because at a given speed the dial reading reflects a true centipose viscosity. The viscosity at 2% KCL solution, with 0.48% solution of the guar gum powder on the fann viscometer on 300 RPM at 250 c and stirring at 1500 RPM) is a minimum of 25 CPS in 3 minutes to 45 CPS in 3 minutes. This powder can be separated from the food grade guar based on the color. The food grade guar is usually white in color while the fast hydration guar is pale to off white color. Thixotropic properties of the fast hydrating guar means it has high gelling rate as required in oil extraction. Apart from the gelling properties, the powder is required to create a gel that is thin enough for easier pumping into the well, while the gel strength increase as it moves through the well and to support the proppant sand and effectively flush it deep into the rock fissures. The gel then has also to be loose enough to flow back and recover the fracking fluid while leaving the proppant behind. This chemical process is very important and to break the gel, chemicals such as Guar + boron + other proprietary fluids are used to accomplish this process. This unique characteristic is very important in the production of oil and gas during the drilling process. It is applied where quick hydration and high viscosity is required. This natural slurrible guar is non ionic and a polymeric viscosifier that is slurrible up to 50% of solids in diesel fuel systems and other similar applications. When the product is used in oil fracturing, it yields excellent pump ability, good hydration, good thermal stability and enhanced shelf life of the petroleum products. The product is mainly used as a surfactant, an artificial polymer and a defoamer which is a critical requirement for water and brine based drilling fluids. With the primary function of the guar being that of viscosity, it has been seen to function effectively in cooling of drill bits, mud drilling and cementing slurries where these properties are required. 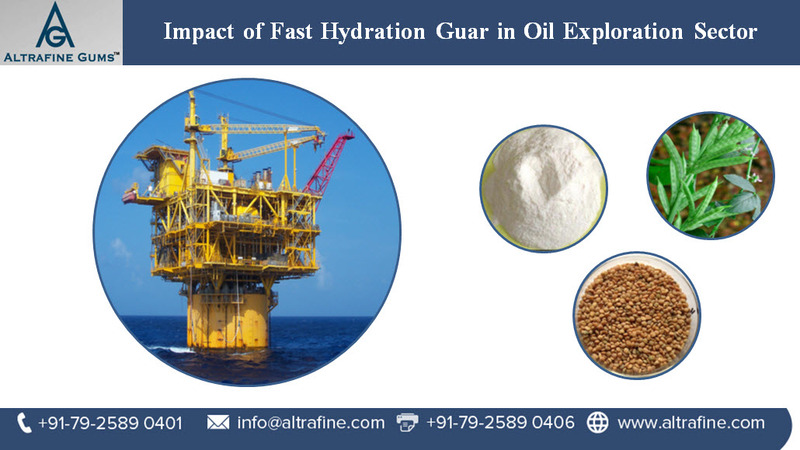 The fast hydration guar has also been heavily used in industry as a stabilizer, thickener and suspending agent in the oil well fracturing agent. The cassia gum is well suited for usage in the manufacture of gels mostly in combination with other colloids and it is generally accepted for usage in the food industry. Further functional effects include thickening, emulsification, foam stabilization, moisture retention and texture improvement. Through a wide range of toxicological studies, it has been demonstrated that the product is not toxic to animals. These studies include sub chronic, reproductive, teratogenic and genetic toxicity studies. The presence of anthraquinones has also been a subject of discussion and a limitation to the utilization of the cassia gum powder in certain food and feed formulations. Some theories have stated that certain anthraquinones have been found to be present in animal products. These are bound to the sugars in form of glycosides, with the glycon occurring in the reduced form such as the diathrones or the oxanthrone. Despite this, only one type of anthraquinone has been detected in the cassia gum powder. Several risk assessments done on the level of carcinogenicity have however concluded that the level of risk is very low compared various other natural ingredients. According to some research, there has been a level of muscle toxicity associated with the components of cassia obtusifolia, although the cassia Occidentalis appears to be more toxic when present in the mixture. Active steps must therefore be taken to ensure that the cassia gum does not contain harmful levels of muscle toxins resulting from the presence of harmful levels Cassia Obtusifolia among the seeds. There are certain indicators that directly influence the global cassia gum usage. These are related to growth in markets such as the dairy ingredients usage, confectionaries market, pet food market and usage in the manufacturing industry. With the production of cassia gum being largely done under natural and rain fed conditions, the production capacity is limited to presence of favorable weather conditions and when these are not met, then the availability of the product is limited. With the cassia gum exhibiting similar characteristics to other hydrocolloids, it would have been expected for the powder to compete at the same level with others such as the guar gum. However, this has not been the case. There has been limited research and marketing information to create a sufficient demand pull for the cassia powder. Heavy industrial consumers for the hydrocolloids such as in the shale exploration still opt for other types of hydrocolloids. In the major producers such as China and India, there has been a pronounced absence of rules and regulations that address the productions and processing phases. This has an effect on the final quality of product reaching the market. This has had an impact in the marketability and usage of cassia gum. 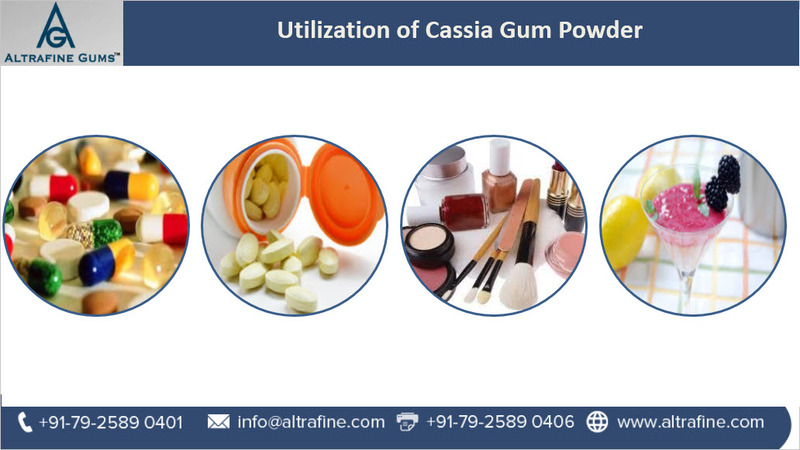 With regulations and approvals in various countries around the world and innovations in the cassia gum formulations, there is likely to be more awareness in the potential of the cassia gum powder for industrial usage. Currently, companies are increasingly utilizing the cassia gum powder in new products mainly in pet food, baby food and production of confectionaries. The Guar ( cyamopsis tetragonoloba ) is mainly a spring to summer crop that exhibits high drought tolerance and grown in various regions around the world. The seeds contains galactomanans which have broad applications in various industries. Some of these applications include softening and thickening properties, flocculation, stabilisation and many other industrial applications. Sustainable crop production is raising crops in ecologically and ethically responsible processes. This mainly includes adhering to the processes of good agricultural practices that will not harm the environment and the crops themselves promote and enhance the creation of a good environment. guar gum has helped deal with many issues of environmental conservation and food security in a world where resources are rapidly shrinking. This crop tends to have longer growing seasons and deeper rooting depths where they intercept, retain and utilize more precipitation. Due to the growth habit, they have longer photosynthetic season and longer green leaf duration which enhances the processes of air purification. The presence of a greater root mass reduces the risks of soil erosion and soil carbon losses compared to other crops. The growing of this crop provides multiple ecosystem services for sustainable production. Some of these activities include prevention of water pollution and nutrients conservation, storage of more carbon below and development of better pest tolerance. The fact that the guar gum is drought tolerant makes it among the best crops for environmental conservation and also for conversion of unproductive areas such as the arid and semi arid areas to more productive and environmentally useful areas. Research on the cost effectiveness and environmental impact of the guar production process compared to other crops has been found to be very low. The guar crop production process has been seen to be less than 3000 kg of CO2 eq emissions and thus a low emissions crop. Continued industrial usage of the guar gum leads to a direct increase in the demand of the product. There have been fears that this increased demand could lead to deforestation as more land gets cleared for growing of the guar. In this case, environmentalists have given caution against this trend as replacing trees with shrubs may lead to an increase in ground level ozone (O3 ) which is a polluting gas. Despite this, the crop has been used to successfully convert previously arid areas into more productive uses. 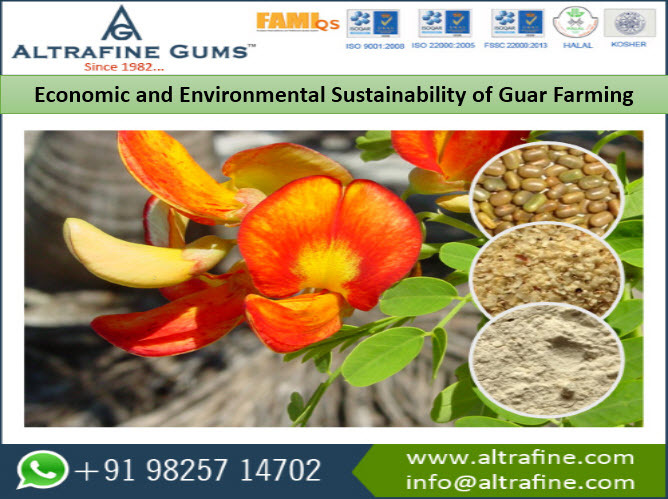 The guar gum has therefore been seen to have more positive environmental impact than other similar plants.